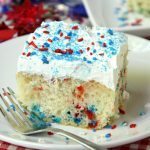 Red White and Blue Funfetti Cake – A simple DIY funfetti cake made with a box cake mix and sprinkles! 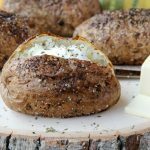 So easy and perfect for Memorial Day and 4th of July! It’s officially Memorial Weekend and temperatures in Wisconsin are expected to reach the upper 80’s. I can’t tell you how excited that makes me! I’m so ready for the sunshine! 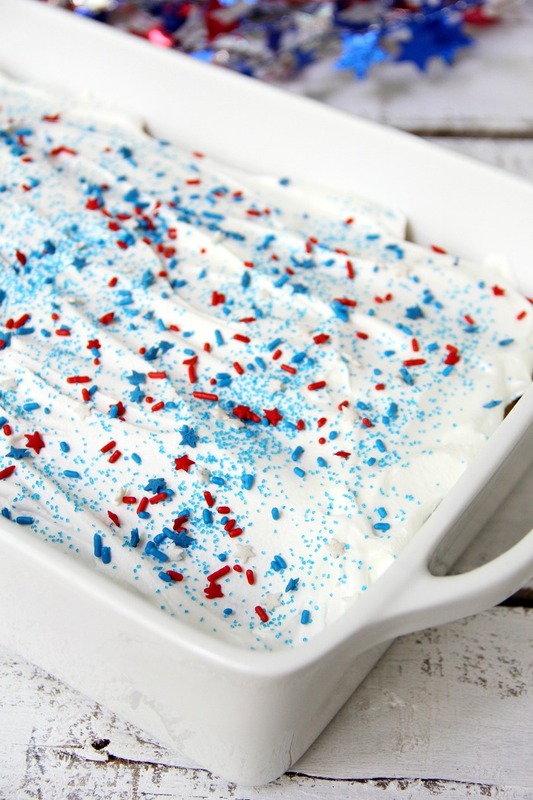 I thought it was only appropriate to post a holiday-themed recipe, so today we’re going to make our own Red White and Blue Funfetti Cake. 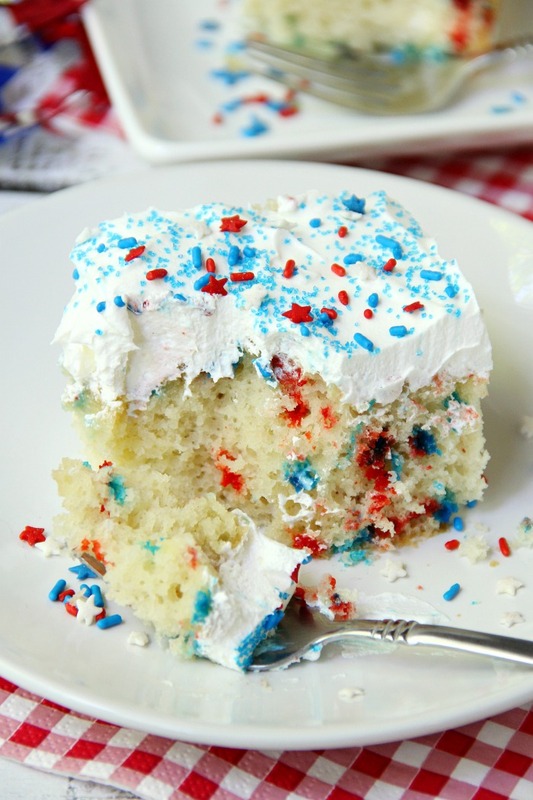 It all starts with a vanilla cake mix – pretty simple, right? 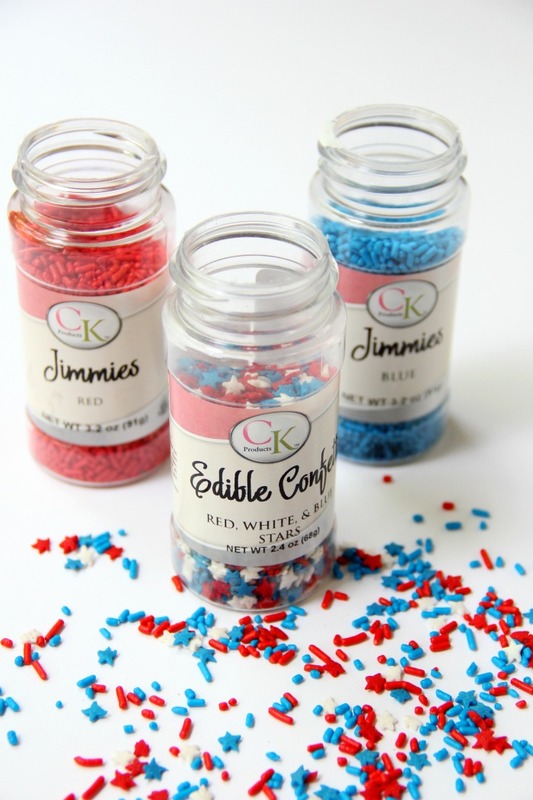 It’s the jimmies, sprinkles and sugars that really dress it up! Let me introduce you to the stars of the show! So, over on the left we have red jimmies. In the middle, we have some super cute star sprinkles and over on the right, are the blue jimmies. I use a combination of all three of these to create the “funfetti” effect in the cake. After you’ve prepared the cake mix, pour half of it in the baking pan and sprinkle in the jimmies and star sprinkles. I like to use a butter knife to cut through the batter quickly and mix them up a bit. I repeat that process one more time with the remaining sprinkles and stars. When you’re adding the sprinkles to the cake batter, work fast and don’t stir them around too much. 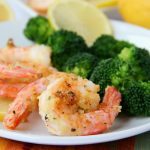 You want to get them on the cake and into the oven as fast as possible. Also, don’t be tempted to add too many. If you pile on too many jimmies, your cake may collapse in the middle.? Once the cake had cooled, I frosted it with whipped topping and added some sanding sugar and extra sprinkles to the top of the cake. So easy, so quick, so festive. Desserts over the holidays shouldn’t take forever to prepare. Who has time for that, anyway? Sprinkles and jimmies are a fun way to add some color to an otherwise plain and simple vanilla cake. Don’t worry if the sprinkles aren’t dispersed perfectly throughout the cake. Each bite looks a little different. I love that about this cake. 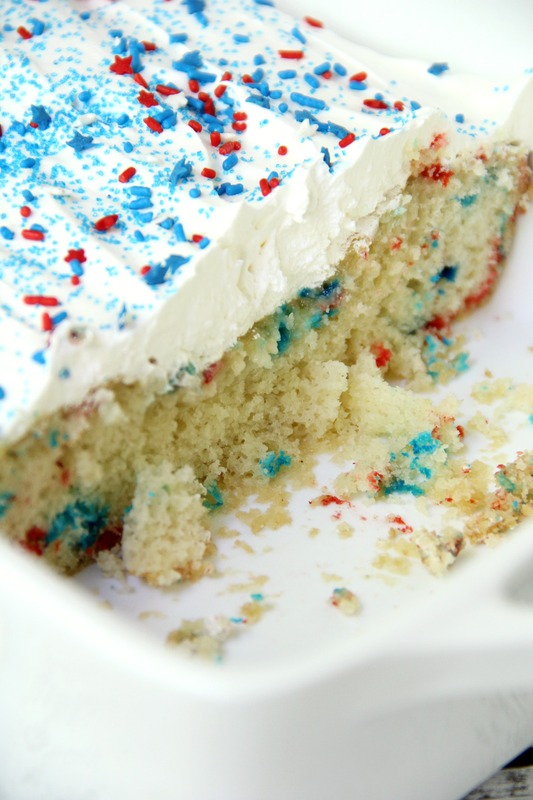 Is it a stretch to say in some parts of the cake, the sprinkles look a little like fireworks? Maybe? Okay, it might be a bit of a stretch.? I also need to mention that kids go crazy for this cake. It’s very moist, and there’s something I love about digging into this cake right out of the fridge. To me, it’s even more delicious when it’s a bit chilled. Yum. I hope you and your loved ones have a safe and memorable holiday weekend. 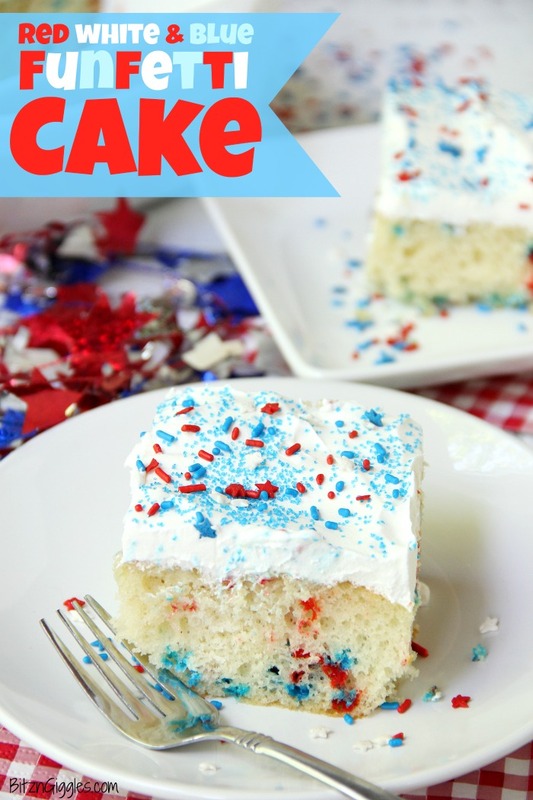 Now grab a box of vanilla cake mix and some sprinkles and get to it! 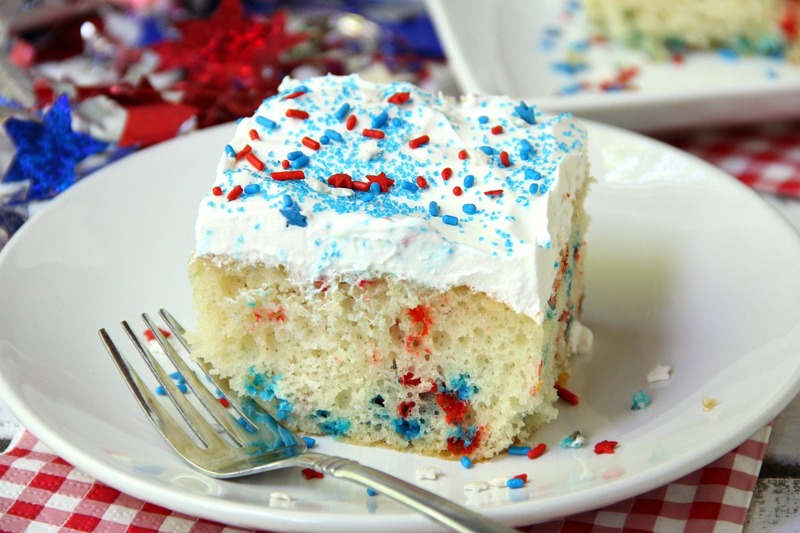 Hungry for more red, white & blue recipe ideas? 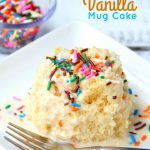 A simple DIY funfetti cake made with a box cake mix and sprinkles! 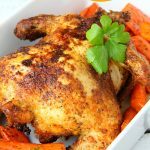 So easy and perfect Memorial Day and 4th of July! 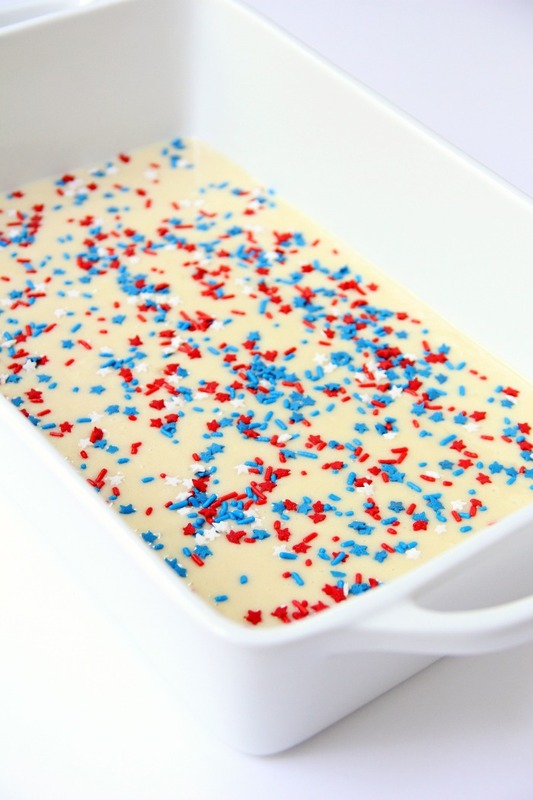 Pour 1/2 of the cake batter into a 9 x13 inch greased pan. Sprinkle half of the jimmies and star sprinkles on top of the batter and mix gently. Pour in the remaining cake batter. Sprinkle the remaining jimmies and star sprinkles in and mix gently. Place in oven and bake according to instructions on cake mix package. Cool and frost with whipped topping. Garnish with sanding sugar, jimmies and star sprinkles.